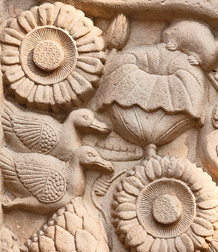 In Sanchi, some of the finest and oldest samples of Buddhist architecture are found. 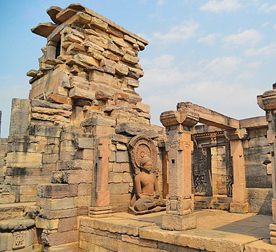 Though not directly connected to the life of the Buddha, Sanchi is linked to Buddhism's most famous convert, Emperor Asoka - and to the advent of Buddhism in Sri Lanka. The Great Stupa at Sanchi is the oldest stone structure in India and was originally commissioned by Emperor Asoka. Its nucleus was a simple hemispherical brick structure built over the relics of the Buddha. The construction work of the stupa had been overseen by Asoka's Buddhist wife, Vidisha Devi herself. 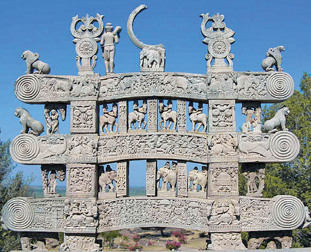 Sanchi was both her birthplace and the venue of her marriage to Asoka. In addition to his marriage to a local woman, a possible reason for Asoka's selection of location may be due to the hilltop being an ideal place for pilgrimage. It is from Sanchi that Arahat Mahinda, the son of Emperor Asoka, set off to Lanka, bearing the message of Dhamma, perhaps with the understanding that the religious philosophy would strongly take root and survive in Lanka. Asoka's daughter Sanghamitta followed her brother and brought a sapling of the Sri Maha Bodhi to the island that embraced Buddhism. She was accompanied by 36 artisans - a visit that enriched the culture and arts of the island nation. These gifts - both spiritual and cultural - are strong bonds that historically link Sri Lankan Buddhists with the Sanchi heritage. Sanchi, a few miles away from the historic city of Ujjain from where Asoka ruled, comes to life once a year, in late November, when a special event - Sanchi Mela - the biggest religious event in Sanchi - takes place, drawing thousands of Buddhists from around the world. At that time, Sanchi is firmly placed on the Buddhist map as it is also the time for an annual holy relics exposition of Buddha's two Chief Disciples, Arhants Sariputta and Moggallana. Chethiyagiri, the vihara standing atop the Sanchi hill, in close proximity to the fabled Sanchi stupas, the Asoka pillars, the monasteries and the four impressive gateways or the thoranas, ,together form a UNESCO-declared world heritage site. In 3 BC, Asoka built the Sanchi stupas and the first stupa housed the famous Asoka edict, also the oldest stone structure in India. More buildings and stupas were added to the existing site ubsequrntly but were destroyed by invaders. Historical accounts indicate in 1815, Gen. Taylor rediscovered Sanchi's ancient ruins though, subsequent amateurish archaeological efforts coupled with continuous plundering, caused further destruction. It is recorded that an Indian Samindar, (wealthy nobleman) split the famous Asoka Pillar to create a cane juice-extracting machine and that Alexander Cunningham undertook a massive restoration programme to rebuild Sanchi. Cunnigham excavated the second and third great stupas - monumental Buddhist artworks, also the site where he discovered the holy relics of the Chief Disciples. In 1919, the stupas were restored to their former glory by the British and the relics were carried away to England. A subsequent request by the Nawab of Bhopal, for the restoration of the relics to Bhopal State and the re-enshrinement at Sanchi, proved successful. The Bhopal State and the Mahabodhi Society reached an understanding to re-enshrine the relics at Sanchi and the Nawab donated a plot of land for the construction of a suitable shrine. He also donated Rs.25, 000 towards the construction of a stupa, now known as the Chietiyagiri Vihar. The relics were ceremonially handed over to the Maha Bodhi Society. The Mahabodhi Society negotiated with the British King and the authorities of Victoria Albert Museum in London to secure the custodianship of the sacred relics, to be re-enshrined in a suitable place. Nearly a century later, the relics were returned to where they were originally discovered, Sanchi. On the last Sunday each November, a full day relics exposition is held in Sanchi, drawing thousands to Chethiyagiri. "Sanchi and Chethiyagiri are spiritually connected to Sri Lanka, particularly to Mihintale, where Buddhism was received by Lanka. Without Sanchi, we would not be Buddhists and it is a place that deserves our reverence," notes the Nayaka Thera, who calls for the celebration of the gift of Buddhism that Asoka sought to bestow on his neighbouring island, to propagate the concept of ahimsa. Poson Poya Day is a celebration of this unique gift from Sanchi to Mihintale.